Before I came to live here in Switzerland, the only way I knew to cook asparagus was to the so-called crisp-tender stage. My favorite way of eating asparagus was simply to stir fry it. But then, I encountered the more Middle European way of cooking asparagus, which is to cook it until it's quite soft. I'd also never seen white asparagus before coming here (well, they had it I guess at NYC gourmet mega-markets like Balducci's, but they never registered in my culinaric vision). White asparagus is indeed more delicate than green, and is really suited to the soft-cooking method, or best of all as the base for cream of asparagus soup. Currently I have two favorite ways of cooking and eating asparagus. The first, an asparagus and egg sandwich, can be made with white or green asparagus. This sandwich is one of those offered by Sprüngli, a patisserie / chocolatier chain that's probably the best of the best in Switzerland. The second, grilled or baked asparagus with balsamic vinegar, is nouveau-Mediterranean / trendy, and needs green asparagus. It's adapted from the book that's in the sidebar, The Best (it's a recipe from Sylvana Franco). This makes great crisp-tender stalks with slightly crispy tops that go with just about anything you might serve for dinner, but especially with roast chicken. Both recipes are amazingly easy, but as with all simple recipes they rely on having the best ingredients you can get. The best quality mayonnaise you can find. Homemade is best, but that makes this rather more complicated. 2 whole-grain or sourdough rolls (but not overly sour, and not the sweet wholegrain type. If you can't find a non-sweet whole-grain roll, a piece of a baguette will do. In the meantime, boil the eggs to the just-hardboiled stage. To do this, put the eggs into cold water, bring to a gentle boil, turn the heat off then put the lid on and leave for 10 minutes. Drain, and cool off the eggs in cold water. Peel carefully. Cut the rolls in half lengthwise. Spread very thinly with the butter. Spread on both sides rather generously with mayonnaise. Slice the eggs, and lay out on one side of the rolls. At this point you can optionally add a bit more mayonnaise. Carefully arrange the asparagus on top. The spear ends can peek out a bit from the edge of the roll. Cap with the other half of the roll. Preheat the oven to 200° C / 425° F or so (hot but not the hottest), or turn on the grill. Sprinkle very sparingly with the balsamic vinegar. You don't want to douse the asparagus with it. To do this, place your thumb over the bottle mouth to control the sprinke rate. Put on plates and spoon over any leftover liquid in the pan over them. Serve immediately. These are fun to eat with your fingers. Submitted by maki on 2005-04-02 15:22. I have often broiled asparagus just with olive oil. Now I can't wait to try this method. It sounds wonderful. Do you like the fat spears of the skinny? I am a fan of the big fat ones. I'm most definitely having an asparagus moment as well, I find that I want to do them justice by making hollandaise to go with it - but often a shaving of pecorino or paremsan and olive oil is just enough. Yum! Well, Maki, I gave it a try with the balsamic etc, green asparagus, baked. It was good but I thought all the flavors detracted a bit. I guess I am just a fan of that pure springy asparagus flavor. Sue, i think i usually prefer the thick asparagus because it's more "inside" which i think is the best part. Though for stir-frying the thin ones are better. Jan I do like it with egg too! Asparagus and eggs or eggy sauce, like hollandaise, go together so well..
Oh, I wish I had not seen this post! I grew up in Southern Germany and we always got white asparagus fresh from the farmer. I did not live in the Asparagus producing region proper so you had to know someone who would get you some and it only was available for a limited time. It was alwayss eaten the same day it came out of the ground. Cooked, (and I don't like it too mushy) drizzled with some butter and maybe bundled in a thin slice of ham. With a nice glas of wine. heaven. Oh dear, I won't be able to stop thinking about this all day. But isn't it a bit early for asparagus? 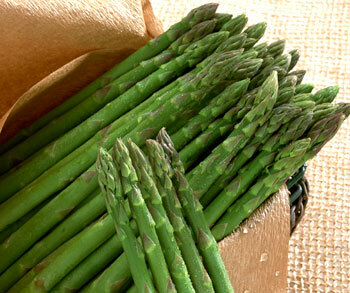 Green asparagus is very different, and none of the white asparagus I see here in NYC looks really fresh. Ooooh must get some asparagus this weekend! I LOVE BBQed asparagus as well as the different methods you guys mentioned! I love asparagus too! My favourite way is to eat it with mayonnaise or mix it with some miso. :-) Gonna give the egg and asparagus sandwich a try when asparagus is in season here in Australia! It sounds yum. How does white asparagus taste like? I saw them at the fruit market here but I never thought about giving it a try. I served baked asparagus with basalmic vinegar with grilled pork chops and a simple risotto this weekend. I'm glad that I followed your advice to sprinkle sugar, vinegar and oil all very lightly. The results were tender-crisp, barely browned and subtly sweet. Even the doubters in my family were impressed. Heck I GROW my own asparagus here in Virginia and yes it's coming on something fierce (I had stalks popping up as early as February -- it's the confused warm weather here this year and a cold snap did the early birds in but they came back when it warmed up and the little bit of snow we cgot melted and watered them). I have been picking spears every day since the last week of March. To get white asparagus, you cover the emerging stalks with straw (or something that doesn't permit the light to get through). Since it's labor intensive, it's why white asparagus costs more and isn't available but for the briefest period of time. I am fond of asparagus cooked stir-fry style in a bit of chicken stock, corn starch, soy sauce and with straw mushrooms thrown in at the last minute (you may have to cut the fatter spears in half lengthwise for more uniform cooking. I also like asparagus wrapped with thin strips of beef round steak marinated in soy sauce and rice wine garlic and ginger that you throw on the grill and then serve with a soy sauce rice vinegar and ginger dipping sauce. Enjoy it while you can! Wrap some bacon around five or so spears and roast it in a hot oven or on the grill. DELICIOUS! asparagus season? urine trouble.. i love prosciutto wrapped steamed spears, and hollaindaise and the sugar sea salt and vinegar... asparagus is very trendy in the southern states and has been a staple throughout my formative years... the old folks like to serve it because they "remember a time when aspargrass only came in cans"..
mmmm...there's absolutely nothing wrong with having asparagus at every meal! My favourite metod is to cook it birefly in a saute pan with a lemon squeezed over, a little salt and a knob of butter. The lemon juice and butter kind of migngle and the juice reduces. It's lovely and tangy. Spargel ist ein königlisches Gemüse. Does anyone else know other ways to prepare white asparagus. My host mother in Pamplona made the most delicious white asparagus I had ever tasted, but all I ever learned was how to peel the vegetables. I believe she put vinegar on the stalks after cooking them, boiling perhaps. But they weren't sweet. They were more sour vinegary. I think she may have put minced onion or garlic on it as well. My mouth is watering just thinking about it. I am a diabetic. I don't know for sure but when I eat aspargrass my sugar is low the next morning. thanks for that idea, gonna try it! Best salad I had ever. I really love it! Thx for the great tips.